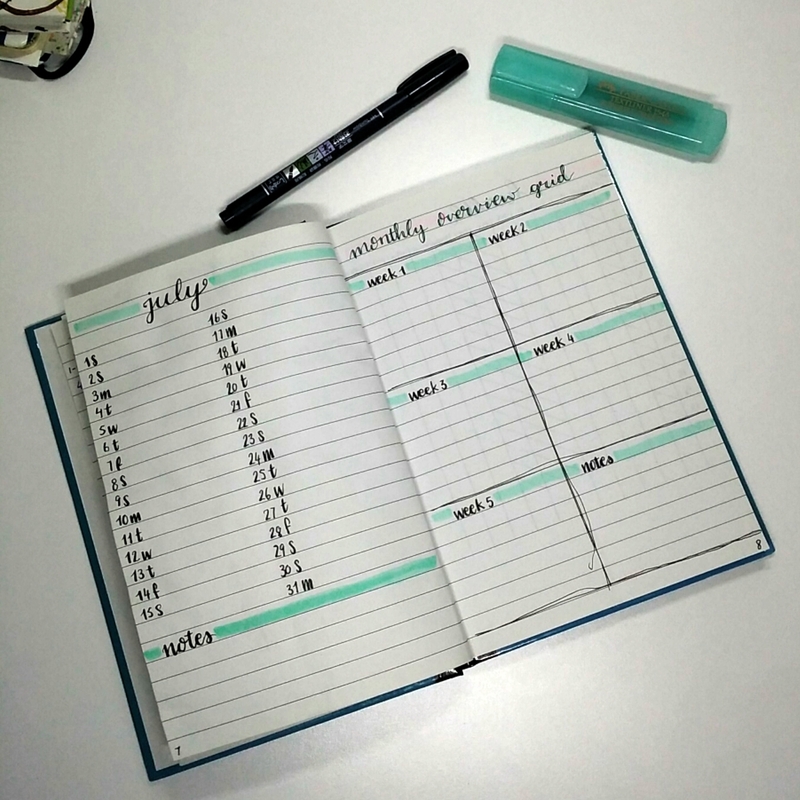 The problem is physical, and keeping track of things is a way for me to monitor my progress and figure out where I might need to adjust my routine. So this month I’ve taken it up again. I thought it would be a good time because I’m starting an elimination diet to identify my allergens, I’m also starting in a range of new supplements which Dr Myhill recommends. Apart from those reasons, I am also quite settled in my new house now and have some things I want to do daily, but staying within my limits is important, so tracking activities and resulting symptoms is all part of the process. I’m going to share a few of the pages I’ve created so far. I decided to make this bullet journal a bit more colourful than the last one which was purely monochrome. I had only ever used a black pen in my previous BuJo! So I’m making cover pages for each month. 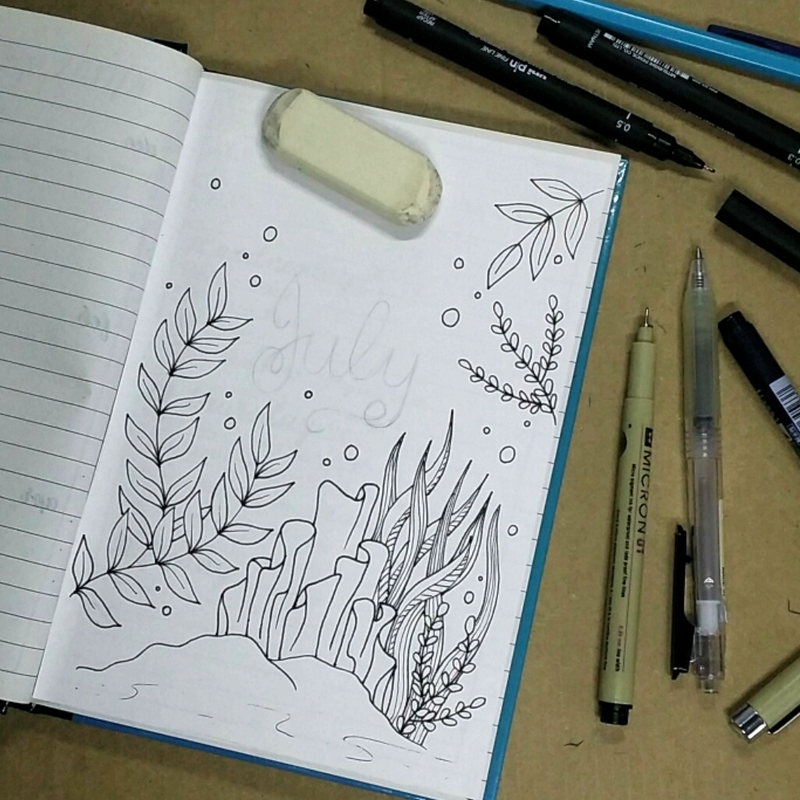 I decided an under the sea theme for July since it’s supposed to be summer. You can se the finished cover at the top of this post. Next up are the monthly overview pages. I had unfortunately already glued the cover page in before painting it, so the moisture from the watercolour severely buckled the page on the left, it looks much worse now than in the picture, but I’m ok with it, this journal is going to be more creative and messy, I’m letting go of perfectionism – it’s an obstacle to creative freedom! You can see the page on the right has some very wobbly lines. I set up this spread while in bed, so things didn’t come out perfectly,and that’s okay too. I like how it turned out with multiple lines drawn in without a ruler. 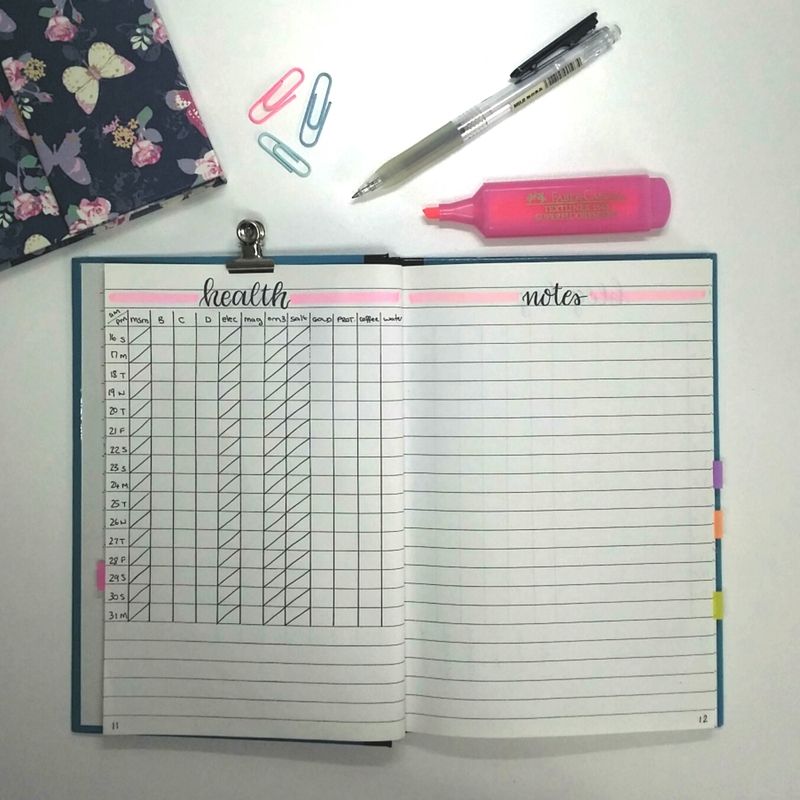 On this spread I track my supplements, water and hot drinks, I also have space for notes and I’ve added a column for my daily step count and a little weather icon since so many people say that their symptoms are affected by the weather. I’d like to see if it’s the case for me too. I’ve never actually taken note of this. Here I will make notes of Bible readings and other books I’m reading. I’ve never tracked my reading consistently, so I’m going to try it. There’s space for notes if I come across a great quote or want to look something up later. On this spread, I’ll log my creations for each day. A way to keep track of my activity levels and make sure I keep practicing. Practice makes progress! There’s a space for ideas and inspirations. This is the main page I’ll use to track activities for the month. The decorated flap on the side folds out and lists the activities down the left side of the page. I couldn’t fit the entire month across the top without creating the extra flap that folds out, so I decided to decorate the back of it. I’m really pleased with how it turned out. I have a few more pages I haven’t shared. 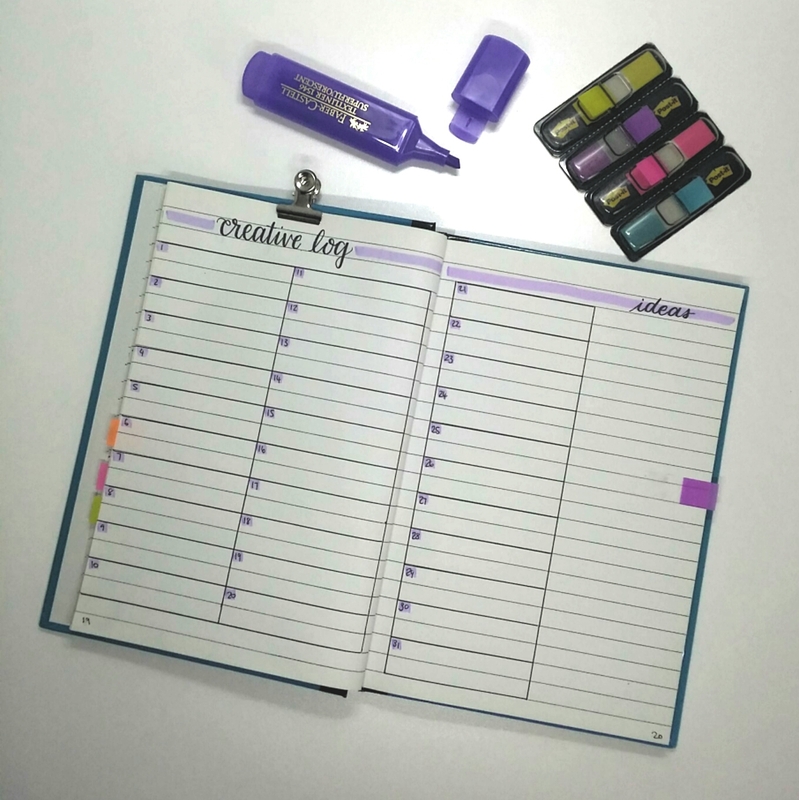 One for tracking blog posts and social media shares. 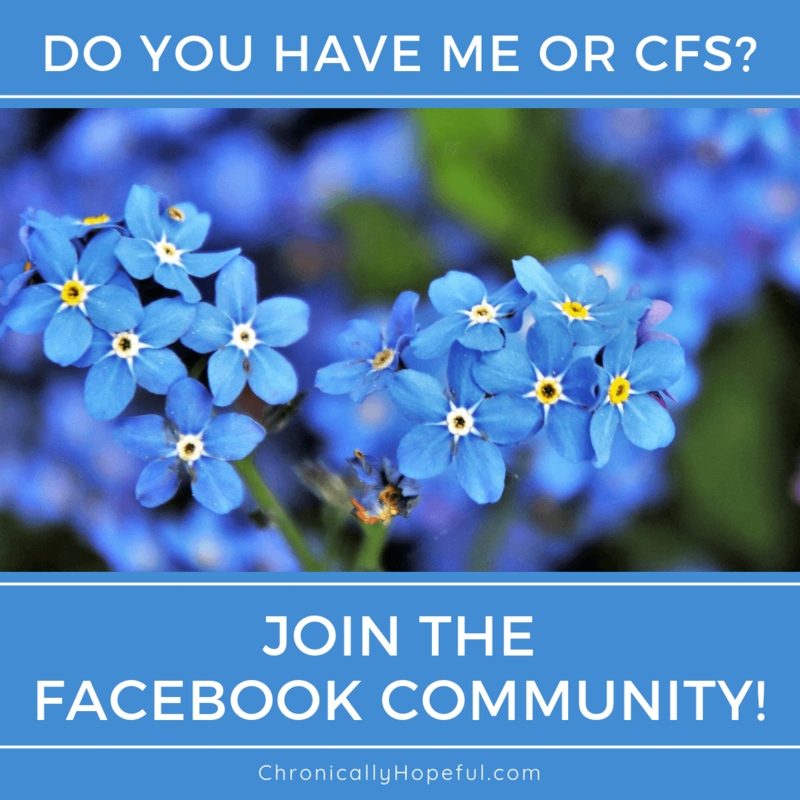 I tend to forget to share my posts to social media, then nobody ever sees them. I also have a weekly meal plan spread with space for grocery list and recipes I’d like to try. I’ve also included a prayer requests page where I keep a list of names and requests. Then lastly, for now, there is the daily log where I simply write the date as the heading and make my to do list for the next day. This doesn’t get filled in advance, I will make the next day’s log the night before and use as much or as little space as I need. I’m really enjoying this layout so far. It’s neat and tidy. Minimalist, except for the cover pages. I don’t think I’ll be writing a lot in this journal like I did in my first one. I’m making use of more efficient trackers and tables to jot quick notes or simply highlight or tick squares. Should be much easier to manage than all the writing in my old BuJo. The paper in this note book is not ideal for lots of decorating, so I think this layout is a good compromise. I’ll look into getting a dotted journal in the future, once this one is full, and possibly one with good quality paper that can be decorated without the bleed that happens in this book. So excited about this new journal and hopeful it will help me keep on top of things from now on! Links above are Amazon affiliate links, this means I will receive a small commission from any purchases you make through these links at no extra cost to you. Thank you for your support! 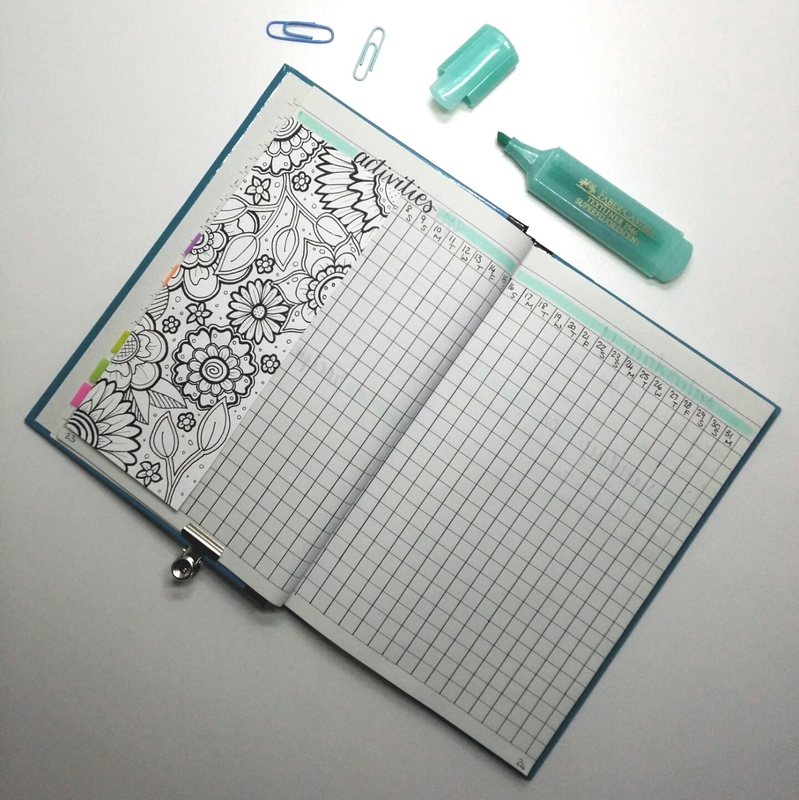 Have you ever tried the bullet journal? 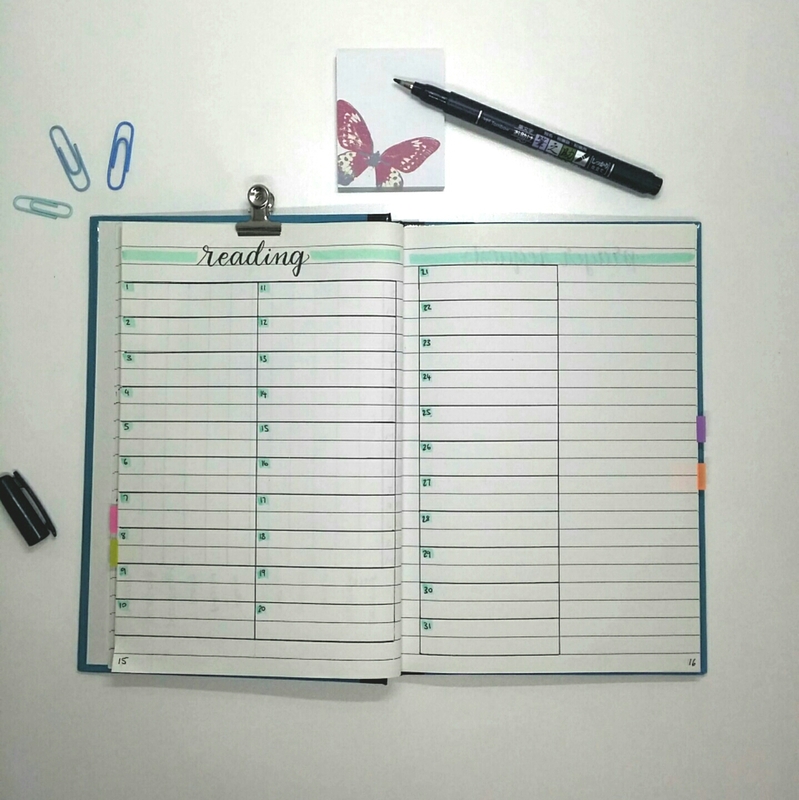 What are your favourite journaling supplies?